A clever 360 degree rotation system makes life easier and less back-breaking for parents. The clever rotation mechanism makes it easy to change between the rear-facing and forward-facing positions without having to take the seat out. Getting in and out is also easy as the seat can be turned to the side facing the door with one simple click. Sirona is secured using the car's ISOFIX system and requires no further fastening. A prop at the front helps to absorb the force of impact in case of a head-on collision and provides additional stability. This anchoring technology minimizes installation mistakes and optimizes the protective effect. The innovative Seat-to-Chassis technology creates a direct link between the seat and the chassis. In case of an accident, the force of an impact is transferred straight to the chassis, which simultaneously activates the safety features of the car and the seat and thereby initiates the process of distributing the force at the earliest possible stage of an accident. Patent pending. The telescopic linear side-impact protection (L.S.P. System) absorbs the force of a side-impact collision at a very early stage (patent pending). Whether rear- or forward-facing, the CYBEX SIRONA's adjustable Linear Side-impact Protection system (L.S.P.) increases the level of safety in case of a side-impact collision. The L.S.P. system can be individually adjusted to the position of the seat and the type of vehicle and absorbs the force of a side-impact collision in combination with the head and shoulder protectors (patent pending). Depending on their shape and size, older children may have insufficient legroom when sitting backwards. In this case, the CYBEX Sirona can also be used as a forward-facing seat with safety cushion - from 9-18 kg (approx. 9 months to 4 years). The adjustable safety cushion with A.R.T. Technology cleverly reduces the risk of serious neck injuries without confining the child (patent pending). Thanks to the new integrated fastening system, there is no longer the need to fasten the cushion separately. 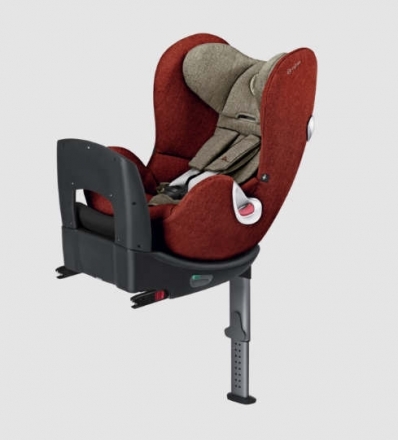 In the forward-facing position, the child is protected by an adjustable safety cushion. This system works like an inflated airbag, which absorbs the energy of impact over its entire area. Compared to a conventional 5-point harness, the strain on the neck is significantly reduced. What is more, in case of an accident, the cushion's new Active Response Technology (A.R.T.) ensures that the child is intuitively secured within the safety zone of the seat (patent pending). Thanks to the new integrated fastening system, it is also unnecessary to fasten the safety cushion with the car seatbelt (patent pending). Comfort version: the soft and cozy comfort version of the Platinum car seats features 10 colour combinations. Leading consumer organisations therefore recommend that children remain in rear-facing child seats even beyond group 0+. The excellent safety performance and clever functionality of the pioneering combination car seat Sirona was awarded TEST WINNER by Germany's leading consumer testing organisation Stiftung Warentest in the test 6/2012.